Hiding in My Craft Room: Fabulous Day! This week's challenge is HIMCR #92 - Yellow, Green, & Pink! I finally got some time to play in my craft room. I love my husband being home and you might think that I should have all this extra time to get things done. However the opposite it reality! My house is a wreck, I hadn't even seen the inside of my craft room in days and I am not sure what I've been doing! There's still some time for you to get a submission done for the challenge! I'm sending this card to my daughter who is at our church's Missionary Training Center learning to speak Ukranian! Frame was cut at 2.5" from the Creat A Critter 2 cartridge. 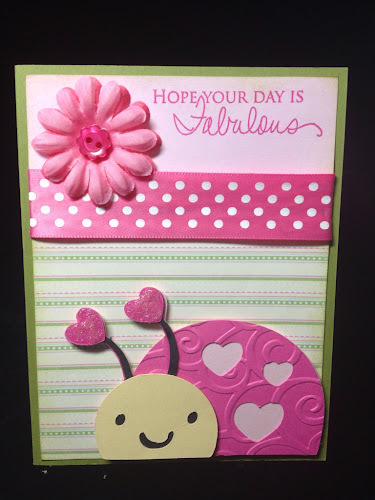 Such a cheerful creation. 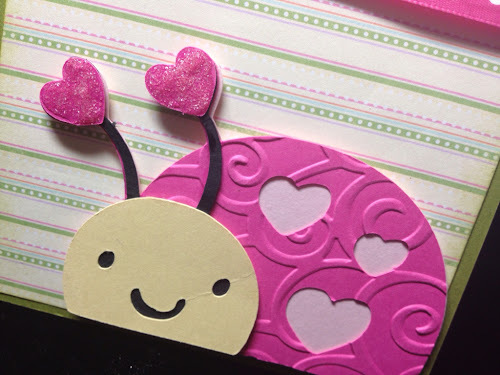 Loving the pink and green and the little hearts on the end of the feelers.